This course will entail one class day on the Portland campus and 10 days in Italy, June 1-10, 2019. The pre-departure class will be held on May 23, 2019 from 9 am to 3 pm. Prerequisite ART 241, ART 341 or ART 342, and/or ART 251, ART 352 or permission of instructor. The course can serve as drawing credit or book arts credit. This travel course to Tuscany will engage the students in the act of experiencing the world around them by using a variety of drawing and book arts techniques to observe, collect, and record the sights and sensations of Spannocchia, the organic farm in Tuscany where we will be in residence for seven nights. The travel experience will begin with 2 days visiting museums and significant architecture in Florence, and will also include a day trip to Siena and the Nikki de Saint Phalle Tarot Sculpture Garden (http://ilgiardinodeitarocchi.it/en/). Students will be able to add on their own trip to the 2019 Venice Biennale. Each student will travel with several blank artist’s books or journals that they have prepared for the journey. These will be developed during the week at the organic farm and during travels to medieval towns, a contemporary sculpture garden, and the museums and architecture of Florence. The last project will be a large completed drawing or an Artist’s Book made after returning to Maine, a book about the ten days in Italy. 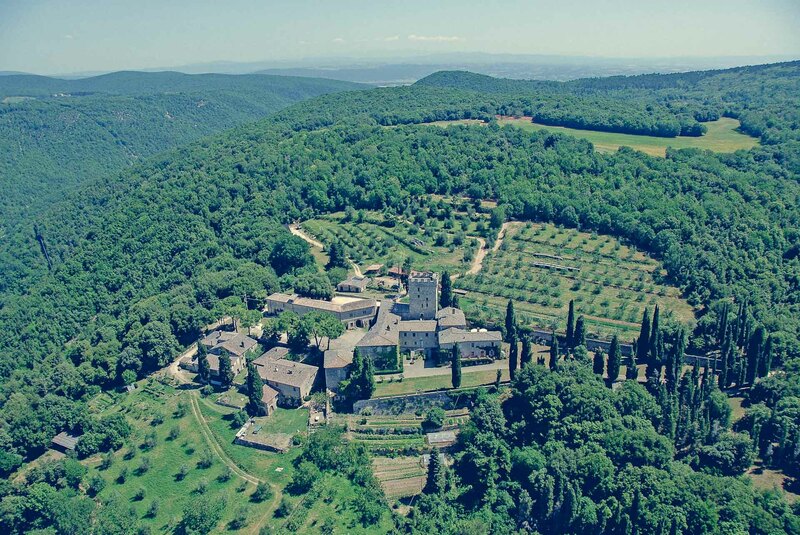 Students will also be expected to produce and submit work done during the residency in Tuscany. Graduate students will be expected to present their residency work in a cohesive fashion for exhibition with their final project and write a reflective paper on one of the cultural visits. Lin Lisberger is a sculptor who taught sculpture, drawing, and design part-time in the USM Art Department from 1981 until her retirement in 2017. Her exhibition experience is widespread and her work has been included in many exhibits, most recently at Chazan Gallery in Providence, Rhode Island and the University of Rhode Island Art Gallery. Lin has been making art for over forty years and over time her sculptures have incorporated many images, always resonating with the attributes of wood. Each sculpture is a sketch of a moment in time and space and the life of the tree. Rebecca Goodale makes unique and limited edition books. Her current project, Threatened and Endangered, is inspired by Maine's rare plants and animals. Her work is in numerous collections including Bowdoin College Library; The Maine Women Writers Collection; New York Public Library; Herron Art Library, IN; Hawai'i State Art Museum; and the White House Ornament Collection. She is the Faculty Director of USM's Summer Book Arts Program, Program Coordinator of the Kate Cheney Chappell '83 Center for Book Arts, and a long-time member of the Art Department. Rebecca is represented by the Turtle Gallery in Deer Isle and by Vamp and Tramp Booksellers in Birmingham, AL. The application deadline is March 15, 2019 along with a $200 non-refundable deposit. The approximate program fee is $1,600-1,750. International airfare and tuition are additional expenses. The program fee includes accommodation, scheduled in-country travel, most meals, cultural/academic excursions and site visits. Not included in the program fee are: cost of tuition and fees, international airfare, books, academic supplies, some lunches and dinners, or other personal expenses. Three credits of undergraduate tuition is ~$880. Three credits of graduate tuition is ~$1300. All participants on USM travel programs receive the in-state tuition rate regardless of residency.